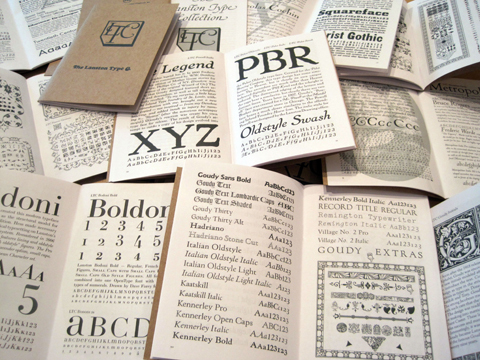 This latest chapbook features the Lanston Type Collection. The designs of the American half of the legendary Lanston Monotype Company made its way to P22 after a series of owners, and now this chapbook officially becomes the first Lanston print catalog in over 20 years. This specimen features dark green ink on the cover and inside. This is the 4th in a series of 6 chapbooks- Each of these 32 page books are printed in a limited edition of 1500 with hand printed letterpress covers featuring metallic inks on chipboard. 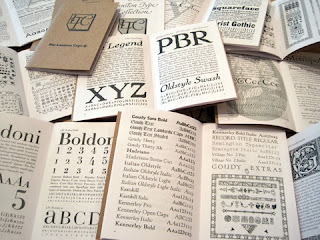 Each book measures 4.5" x 6.5".Each chapbook is $3 (shipping is additional). Save if you order 4 or more books in the series. Subscribe to receive all 6 chapbooks contained in the series for $15.00. Reminder: The Torleiv Sverdrup sale offers expire on August 15th. P22 is featuring the designs of Norwegian type designer Torleiv Sverdrup. Torleiv has designed 9 font families exclusively for the IHOF Collection, including Coda, Foxtrot, Hoy, Kirkwall, Late November, Mai, Spiggie as well as the highly decorative font families Speyside and Ornes. Each font possesses its own flavor with inspiration drawn from the contrasting shores of faraway places such as the Orkney Islands, Tobago and his native Norway. As part of this designer spotlight, each of Torleiv's font families can be purchased for a 25% discount, plus a special offer on a select pack of fonts as well as the entire collection. For more information on the Torleiv Sverdrup Special, click here.